Need a lift in the middle of work week? Come treat yourself with some sweet, boozy desserts at Milk Tavern! Don’t miss out on a fun night to mix and mingle with other young professionals in the community. Hope to see you there! 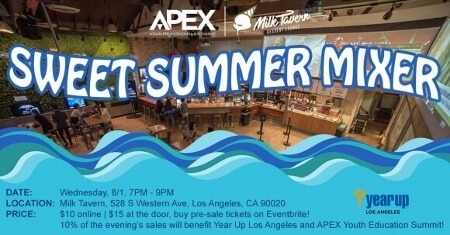 Special thanks to Milk Tavern, who will be donating 10% of the evening’s sales back to two educational programs – Year Up in Los Angeles & APEX’s Youth Education Summit. Year Up Los Angeles seeks to close the Opportunity Divide by providing young adults with the skills, experience, and support that will empower them to reach their potential through professional careers and higher education. They achieve this mission through a one-year, intensive training program that provides low-income young adults, ages 18-24, with a combination of hands-on skills development, coursework eligible for college credit, corporate internships, and wraparound support. APEX’s upcoming annual Youth Education Summit (YES) is a career day for at-risk youth to engage and explore their ideal career path taking place in early September. We will showcasing this event during our mixer.